I love exploring the shelves of Spanish pharmacies during my summer holidays but until recently I would be hard pushed to name their well-established beauty brands. But guess what? When an opportunity arose to meet up with the team behind Sepai, a brand which fuses genomic technology with natural actives that will address your skin’s needs and concerns, I jumped at the chance to learn & talk about the habits of Spanish women that we can benefit from. Sepai was founded in 2008 and officially launched in 2009. In Spain it is sold via beauty salons and cosmetic clinics, including the Instituts Saurina, Barcelona’s leading anti-ageing Aesthetic Clinic, where trained personnel can assess your skin and recommend the right treatment and skincare regime to address your skin’s needs and concerns that you might have in a specific moment in time or depending on your age, skin type and season. Paola Gugliotta is one of the brand’s founders and judging by her skin Sepai definitely deserves the attention. When we meet, Paola arrives straight from her flight from Barcelona, looking calm and beautiful. Her complexion is radiant and smooth, with barely any make-up, the type you instantly want to replicate. During our conversation she pauses before answering or answers quickly, depending on the subject we address. She is honest & inquisitive about my own opinions on skincare, making the conversation flow easily and one question and answer leads naturally to others. -Focus on the experience in the beauty industry, with less emphasis on the marketing and more on the technical side of developing the products. – The concept behind Sepai focusses on the principles that are really important, including the changes in the skin that aren’t noticeable to the naked eye. Technology is invisible, results are not, hence the emphasis on skin’s structural integrity. Sepai products promise ”to change the way skin performs on the cellular level, restoring the regenerative abilities”. Consider Sepai skincare as a personal trainer for your skin which seek to improve skin’s performance & optimise its functions. – Sepai doesn’t use sensitising or potential skin irritants. The team examines scientific evidence demonstrating negative effects of the use of a particular substance and then add it to their list of ‘non-desired ingredients’. They also avoid using ’empty’ substances that are only added to the formulation to give a texture or finish. – it is possible to customise many of Sepai products with concentrated extracts based on the client’s specific needs. When it comes to Sepai products you can choose from Facial Serums, Eye Care, Facial Moisturisers, Body Treatments, Tune it Extracts & Basic Skin Preparations. There are Base Products for Face & Body to which you can then add up to three The Extracts which you can see in the image below, to address issues like volume, elasticity, firming, tan prolonger, relax. Our skin is a living thing, so addressing its needs might be not as straightforward when you don’t know if your product you use is actually targeting what gives your skin a problem. Sepai does focus on causes of ageing and tries to optimise metabolical processes within the skin’s matrix but you won’t hear the brand making unrealistic promises. Paola honestly & firmly says again and again, in the course of our meeting,that when you start using Sepai products the results won’t be immediate. If you choose to use Sepai products you can & will see improvements ( I noticed subtle changes within three weeks of using the products ) within six months, particularly in the quality of your skin on the face and body, depending where you use the products. Sepai products aren’t organic certified but they do use organic emulsifiers and extracts, however their primary focus is on the safety of their formulas. You won’t find parabens, sothiazolinones, sulphates, phthalates, mineral oils, PEGs and paraffins, petroleum, allergens, aggressive emulsifiers and surfactants. – DNA protection ( the focus here is on keeping genetic material intact & helping to keep skin cell’s DNA clean and intact, safeguarding its immunity capacity. Think about it from the point of view of the ‘copying’ process – quality of the DNA of an ‘old’ cell is in theory better than the new one emerging in its place ). The best age to start using Sepai products is from late 20s but as Paola pointed out to from the beginning, don’t expect immediate results. In Spain Sepai range is popular with women in their 40s and Paola reminded me of a wonderful tip on the importance of extending your moisturiser and serum to your neckline. another useful thing to know if you are now considering trying Sepai face products, is this: if you don’t have particular eye area problems, you can use Sepai face serums around the eye area as well and while we both agree that the area around the eye has a more delicate skin, opinions on the need of a separate eye area care product vary. My own Sepai journey started with the mini kit or rather the Sepai Box ( see the image below ), the likes of which I haven’t come across before. 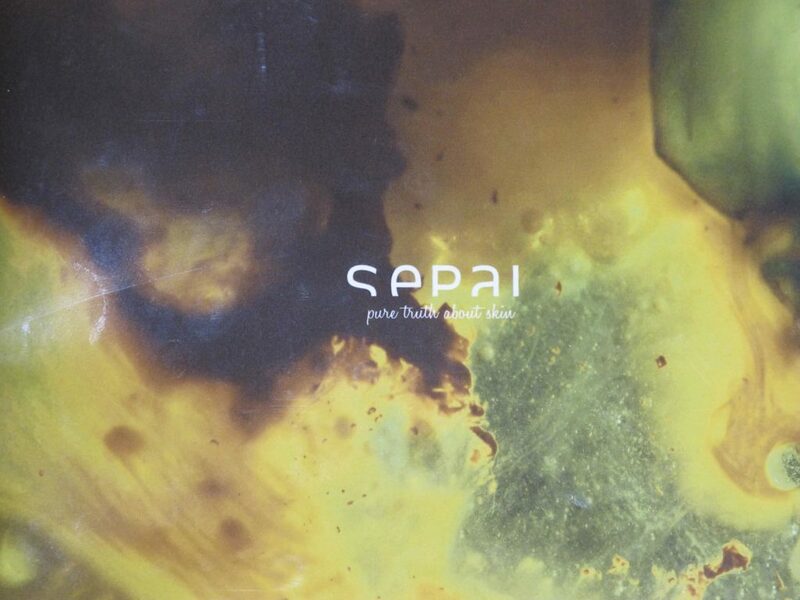 It gives you a great overview of Sepai products, their smells, textures & benefits. As for the rest of my Sepai products impression, my review is in the works and will go up on the website very soon. Do leave your comments or questions while I write it please, I would love to know your initial impressions. I spotted the range in Selfridges at the end of last year and was intrigued with the syringe packaging. I’m not sure it it’s still there or not. Interesting how much the UK is getting in to targeted serums.